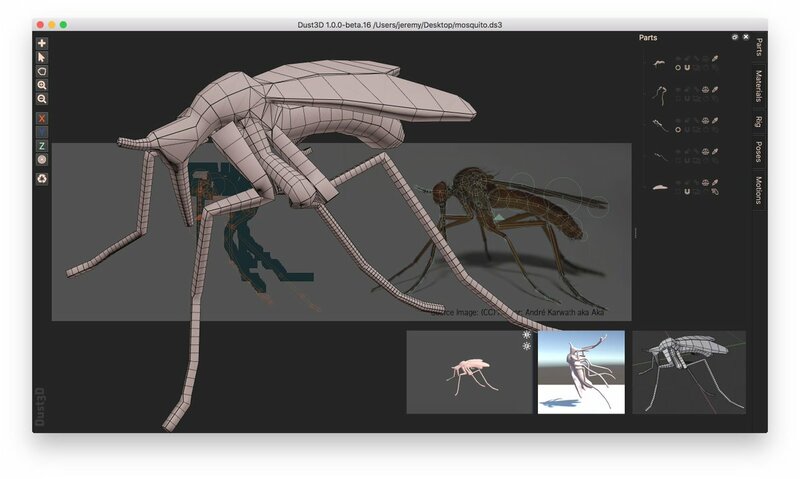 Dust3D is a quick 3D modeling software. It automatically generates a mesh from nodes drawn by the user. Most of the code is implemented in C++ with Qt, including the UV unwrapper, rigger, pose and motion editor etc, however, the core mesh algorithm was written in Rust. Recently I have rewritten the Rust part. The codebase is pure C++ now. I have been asked if I am going to migrate more of the C++ code in Dust3D to Rust, and there is another author who has contributed many excellent improvements on the Rust code, thanks anderejd. I think I’d better explain a little bit why I dropped the Rust implementation from Dust3D. The mesh generator was originally implemented in pure C, then migrated to Rust. Why did I switch to Rust? C is quite lacking in infrastructure, but I was sick of different C++ trivial variations across different platforms, it’s a pain to introduce a third party library if you want your whole code to work on different systems with different versions and brands of compiler. Rust has all the merits I wanted, it’s easy to start, painless to include other libraries, and most importantly, it’s memory safe. If you have ever been heart attacked by core dumps, you will know how beautiful this is. Given so many advantages, why I am switching back to C++? The most beautiful thing about Rust is also a disadvantage. When you implement an algorithm using C++, you can write it down without one second of pause, but you can’t do that in Rust. As the compiler will stop you from borrow checking or something unsafe again and again, you are being distracted constantly by focusing on the language itself instead of the problem you are solving. I know the friction is greater because I am still a Rust learner, not a veteran, but I think this experience stops a lot of new comers, speaking as someone who already conquered the uncomfortable syntax of Rust, coming from a C/C++ background. Another reason is the Rust ecosystem is still immature. As an indie game developer I can see the situation is changing, there is a website Are we game yet? that lists many neat things in the Rust world, there is a data driven game engine written in Rust called Amethyst, all these things look really promising. But, there is no Qt, no CGAL etc, all these frameworks and libraries have been developed for so many years and maintained very high level of quality. I know there are some bindings, but it’s not mature and not enough.